The following video clips and paintings were inspired by a pilgrimage to the Sub Antarctic island of South Georgia and the Antarctic Peninsula in October through December 2017. It has been my long term project to record and raise awareness about the fragility of these natural wonders as well as try to express their inherent beauty. 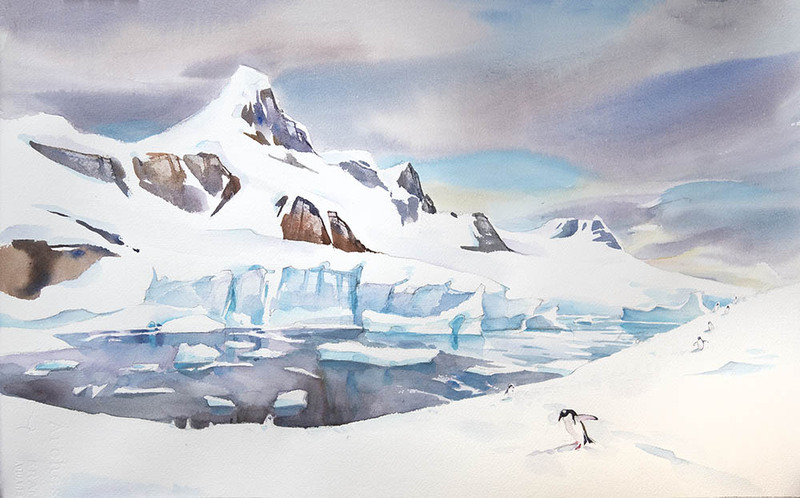 Many more paintings and video circumnavigating Antarctica can be viewed on my Antarctica page. Many thanks to One Ocean Expeditions and the team for logistics and a successful voyage! 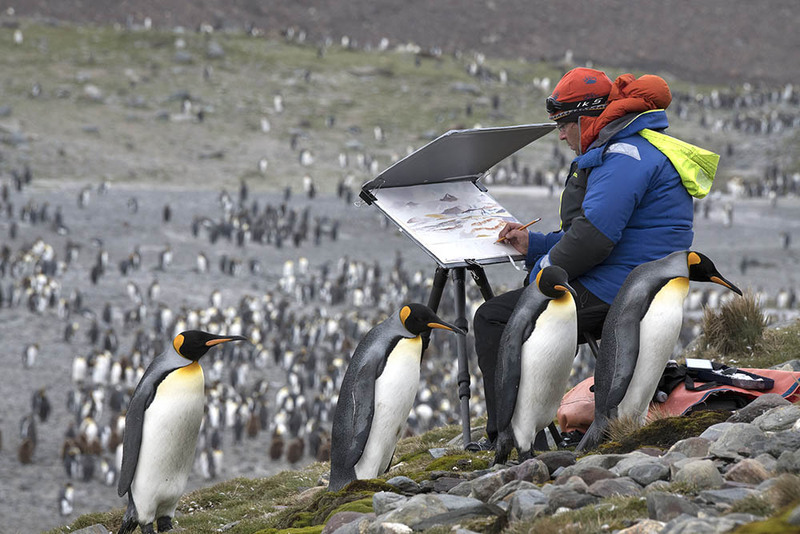 Wildlife highlights and the challenges of painting on location while painting in watercolour overlooking the big three king penguin colonies on South Georgia Island: St.Andrews Bay, Salisbury Plain and Gold Harbour. 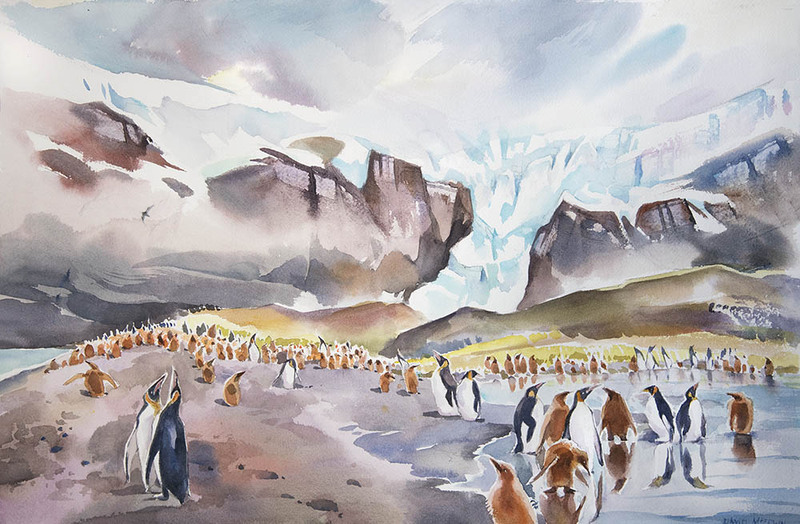 Painting and wildlife video time lapse highlights from Antarctica , including early season visits to Mikkelsen Harbor, Cuverville Island and the south shetland islands. 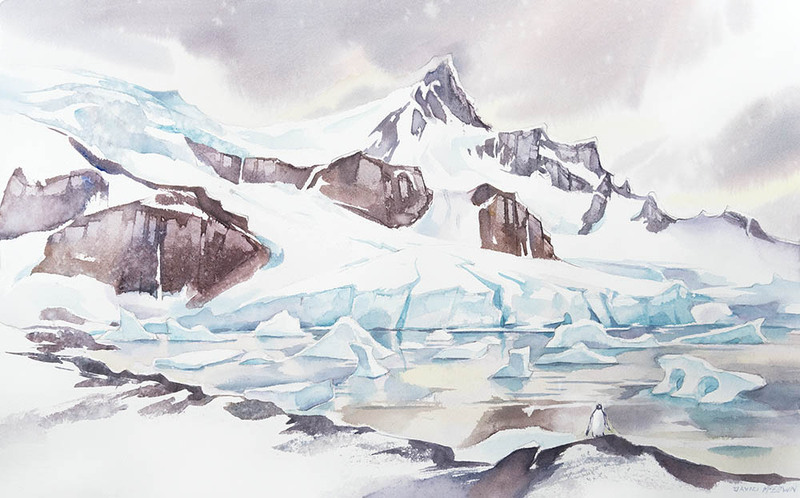 Encounters with jumping penguins, breaching humpbacks and a weddell seal animate the contemplative process of watercolour painting. Once again we visited the antarctic peninsula as part of the team at One Ocean Expeditions. However this time we arrived later in the season and saw lots of seal and whale action including many adolescent and energenic penguin chicks! 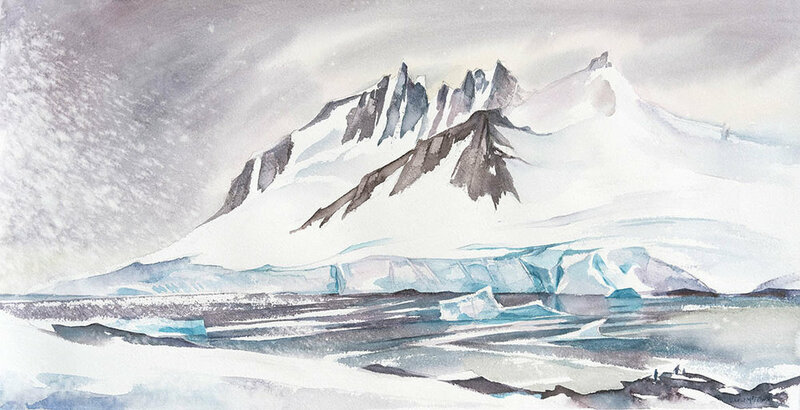 Posted here are video journal highlights , and a selection of Antarctic paintings completed on location. A collection of video impressions from the Antarctic Peninsula , including David painting the dramatic glacier at Neko Harbour. This short video is shot while painting on Petermann Island, a special place to observe the variations of penguin species nesting and the changes in populations due to climate change. In this case David encounters 2 young adelie penguin chicks walking into the foreground in front of a dramatic backdrop. During a voyage in the Antarctic Sound aboard a Russian research vessel , David paints in sub zero temperatures to allow chance effects and interplay of the weather and the mark making process, all the while trying to convey the scale and mood of immense tabular icebergs appearing through the advancing storm. On the way north , the ship surveys the shores of Elephant island and David has a chance to work on a few paintings of "Point Wild", this is were the members of Shackleton's party were rescued.